Topic: Problems with Winamp support? Winamp 5.20 introduced a new feature, that could mess with GTSdll. To be more specific, it could be that GTSdll does not display the song you are playing, but some different one. Also it won't be able to display tags like album, genre or tracknumber. To fix that you'll need to set the correct directory in GTSdll Settings. If you select Shared settings for all users you'll need to set the winamp Directory in GTSdll settings to the installation directory of winamp. If you had GTSdll installed before, you probably don't need to change anything. 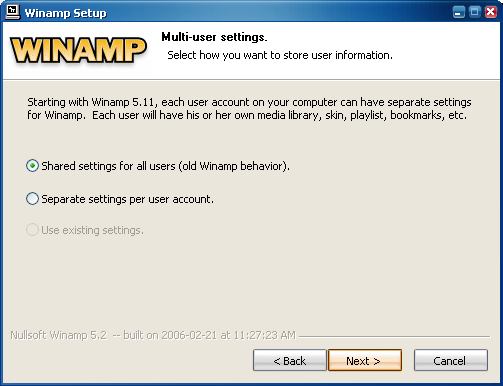 But if you select Seperate settings per user account you need to set the directory to %appdata%\Winamp. and something like C:\Users\USERNAME\AppData\Roaming\Winamp\ on Windows Vista. The red part ~usually~ needs to be replaced by the name you use to log on into windows. It can differ! To be asolutely sure, right click on your "my documents" folder, and check the path in there. Hm, i had no problems at all with latest (5.21) winamp, and i can't think of anything that stops gtsdll from working correctly with winamp, except the directory thingy. I think winamp support is the only "it always works" thing on gtsdll. Just figured it out -- I forgot to add a trailing backslash when I changed my path to the %APPDATA% one. Might be a good idea to add a check for that in a future release.